Renowned stage magician Jasper Maskelyne and his "Magic Gang" used their skills to weave intricate webs of deception, making things appear that weren't actually there, and things that were, disappear, to deceive the enemy. In 1940 a group of artists, sculptors, film makers, theatre designers and set painters came together to form the Camouflage Unit. Led by Major Geoffrey Barkas and including among their number the internationally renowned stage magician Jasper Maskelyne, the unit's projects became a crucial battlefield weapon. At the siege of Tobruk the unit made a vital desalination plant appear to have been destroyed by enemy bombers; from then on they used their storytelling skills to weave intricate webs of deception, making things appear that weren't actually there, and things that were, disappear, to deceive the enemy. Their stage was the enormous, flat and almost featureless Western Desert. The unit's schemes were so successful that in August 1942 the Unit was ordered by General Montgomery to come up with a way to hide the preparations for the Battle of Alamein, the biggest battle the 8th Army had ever fought. 'Operation Bertram' was born. In six short weeks two divisions, with armour, field guns and supporting vehicles, were conjured from the sand, while real tanks and lethal twenty-five pound field guns vanished from sight. Then, on the eve of the battle, the unit performed the biggest conjuring trick in military history. Right in front of the German's eyes they made 600 tanks disappear and reappear fifty miles away disguised as lorries. Rommel had been bamboozled by an army made of nothing but string and straw and bits of wood. 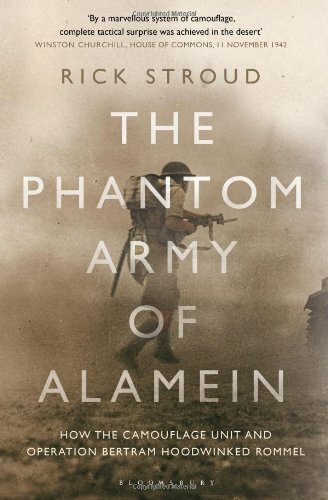 The Phantom Army of Alamein tells for the first time the full story of how some of Britain's most creative men put down their brushes, pencils and cameras to join the rest of the world in the fight against the Nazis and played a vital role in the winning of the war.